Here's a shot I took earlier in the week from the Humber Bay Arch Bridge. 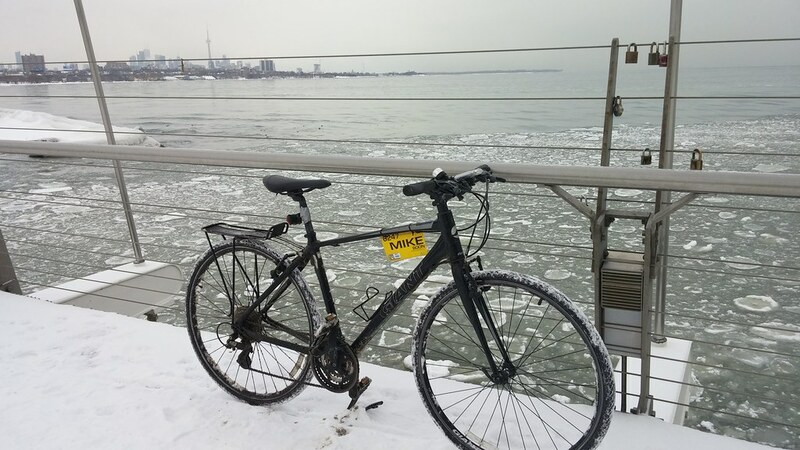 This was Monday, and those floating chunks of ice were completely gone when I biked by yesterday. The Martin Goodman Trail, except for this bridge, is completely plowed and salted, if you're looking for a safe route. Damn that Rose... there was room for two on that piece of wood! oh that's right it was a chunk of wood, not ice. Surely she would have died too if it was ice. On a sorta-kinda-related note, if you watch raiders of the lost ark from one of the original prints, you can see the reflection of glass that separates Indy from the snake when he first falls into the well of souls. You just ruined my childhood. Gray, gray, gray...and one splash of yellow. Monday was a very grey day... yesterday was much sunnier. The photo reminds me of a motorcycle styled kid's bike I once received. It came with a big yellow 'TigerCat' sign attached between the triangular framing. After a few "Hey TigerCat" shoutouts, I then removed the sign. @Mike - Monday was indeed a gray day. Apart from the yellow, the photo would not likely look any different if it was taken/displayed in black-and-white/grayscale mode. What's with all the locks on the cables? Strange. They're kind of like seeing pairs of running shoes in trees or on high wires. I'm giving up my ride today for Damien Cox.